Although John Burnside is a prolific and award-winning writer (he is one of only two poets to have been awarded both the T.S. Eliot and Forward Poetry prizes for his collection, Black Cat Bone and in addition to over a dozen volumes of poetry he has written non-fiction, novels and a screenplay), The Devil’s Footprints is my first encounter with him. Michael Gardiner has lived in Coldhaven, a seaside town in northern Scotland, his whole life. His parents were distant, creative people: his father a well-known photographer, his mother a painter. They were outsiders when they came to the village, but it’s the only home Michael has ever known and he lives in the house where he grew up with his wife, Amanda. 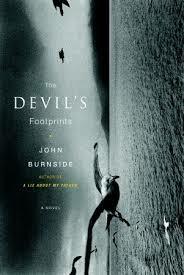 When The Devil’s Footprints begins, Michael is considering the deaths of Moira Birnie and her two young sons. Michael had a brief relationship with Moira back when he was nineteen and the circumstances of their deaths troubles Michael. He also wonders why Moira’s 14-year-old daughter, Hazel, was spared. But The Devil’s Footprints is not a mystery. Burnside effortlessly weaves past and present, illuminating his solitary childhood and the fact that he was mercilessly bullied by Moira’s older brother, Malcolm. “I always walked to and from school alone. I didn’t have a best friend, I didn’t really have friends at all,” Michael recalls. The thing of it is, Michael seems decidedly unstable, especially after he becomes fixated on Hazel. There are all sorts of Nabokov comparisons to be made in their relationship; Michael makes them himself. But it isn’t until he packs his bags and spirits young Hazel away that the reader starts to understand the huge knot of grief Michael has been carrying around with him. Did I like The Devil’s Footprints? I think it’s a book that does an admirable job of reaching into the dark heart of one character. The writing is, understandably, poetic. I am glad that I read it. This entry was posted in Book Chat and tagged 2014, Book Review, literary fiction by Christie. Bookmark the permalink.